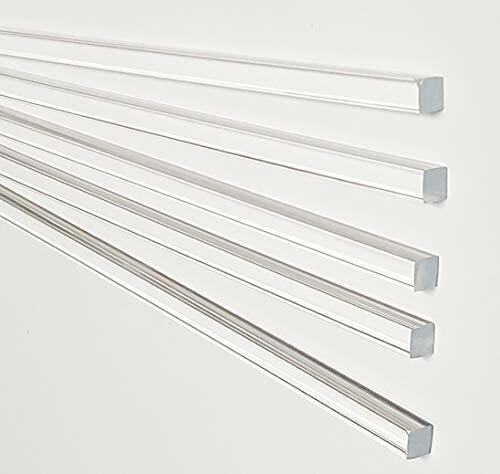 6 Pieces 1/4 Diameter 12 Long Clear Acrylic PLEXIGLASS Lucite Plastic Rod .25"
This is a Package of Solid Clear Acrylic Round Rod. FEATURES: Strip and Rod Series. Also quite useful and attractive in crafts and educational projects. Precision Extruded in Clear Acrylic Plastic. The transparent clear acrylic round rod resists yellowing and degradation from ultraviolet light and meets Underwriters Laboratories UL 94HB specifications. Acrylic is a lightweight, tough plastic that offers transparency similar to that of glass. 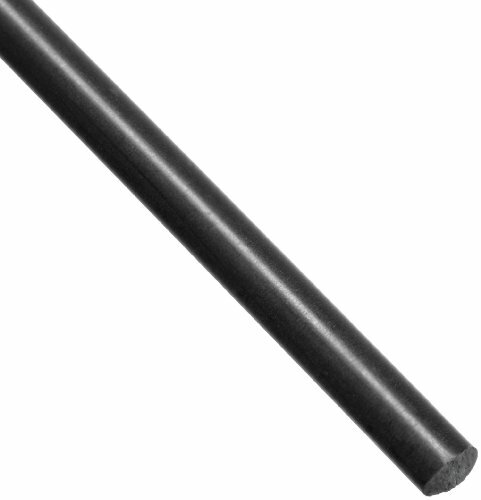 The opaque black acetal copolymer round rod has a standard tolerance and meets American Society for Testing and Materials ASTM D6778 specifications. Acetal copolymer is a strong, rigid plastic that offers excellent dimensional stability, enhanced by the material's moisture and creep resistance, and maintains its properties better than acetal homopolymer when exposed to hot water, hot air, and humid environments. The material has a low-friction surface and excellent abrasion resistance. 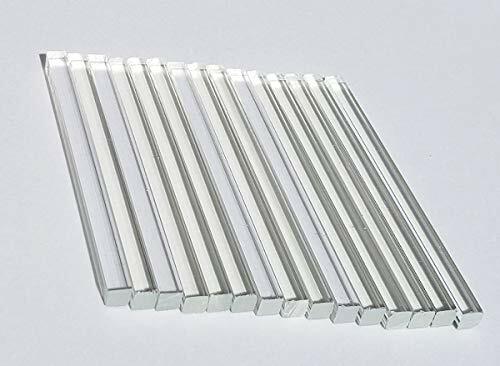 You are buying 5 (FIVE) NEW 1/4" x 1/4" x 36" LONG CLEAR SQUARE EXTRUDED ACRYLIC RODS. 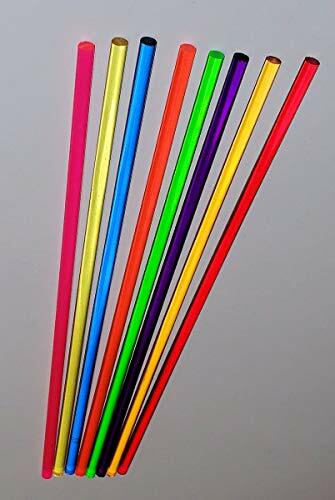 (One Quarter Inch X One Quarter Inch Square X Thirty Six Inch Long) SQUARE ACRYLIC ROD FACTS YOU SHOULD KNOW BEFORE BUYING 1. THE SQUARE SIZE DIMENSION STATED IN THE AUCTION IS NOMINAL. IT IS NEVER AN ABSOLUTE 1/4". REGARDLESS OF THE SIZE AND REGARDLESS OF THE SELLER THE SIZE IS ALWAYS NOMINAL. IT IS NEVER EVER A TRUE PERFECT SIZE. 2. THE SIDES OF SQUARE RODS TEND TO BE SLIGHTLY CONVEX OR SOMETIMES CONCAVE. THEY ARE RARELY ALWAYS PERFECTLY FLAT. THAT IS THE NATURE OF EXTRUDED ACRYLIC SQUARE RODS. 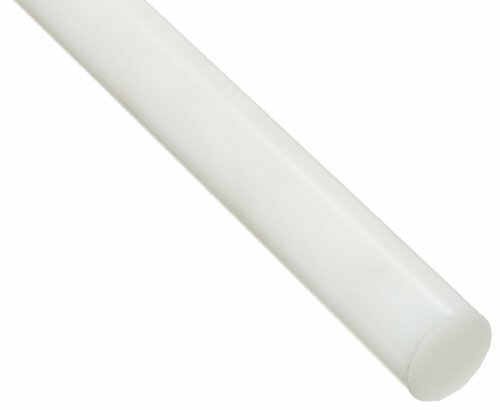 CAST ACRYLIC RODS ARE USUALLY PERFECTLY FLAT. THIS IS EXTRUDED AND NOT CAST 3. ALL EXTRUDED ACRYLIC RODS ON THE PLANET EARTH ARE MANUFACTURED THE EXACT SAME WAY AND HAVE THE EXACT SAME PROPERTIES MENTIONED HERE, REGARDLESS OF THE MANUFACTURER. A LITTLE RESEARCH ON GOOGLE WILL CONFIRM THESE FACTS. To assure that you get the finest quality, the protective sleeve is kept in place on the rod while being cut to protect the acrylic. Rod has saw cut edges on both ends. Please allow a length tolerance of +/- 1/16" on all pieces. 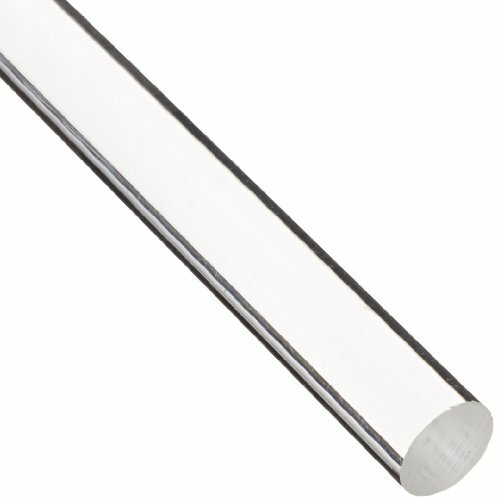 The transparent clear polycarbonate round rod has a standard tolerance and meets American Society for Testing and Materials ASTM D3935 specifications. Polycarbonate (PC) is a durable plastic that maintains its toughness, dimensional stability, and excellent impact resistance in a wide range of temperatures. Typically, the material maintains its electrical insulating properties and resists creep in extreme temperatures and humid environments. Transparent clear polycarbonate is often used as a lightweight, impact-resistant alternative to glass. 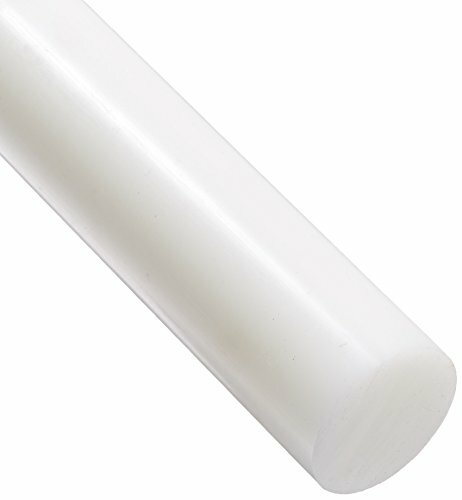 The opaque off-white HDPE round rod has a standard tolerance and meets American Society for Testing and Materials ASTM D4976 specifications. HDPE (high density polyethylene) is a rigid, tough plastic that offers good chemical resistance and low moisture absorption. HDPE is stronger and more rigid than LDPE. The Phenolic G-10/FR4 round rod has an opaque natural color and meets United States Military Standard MIL-I-24768/27 specifications. 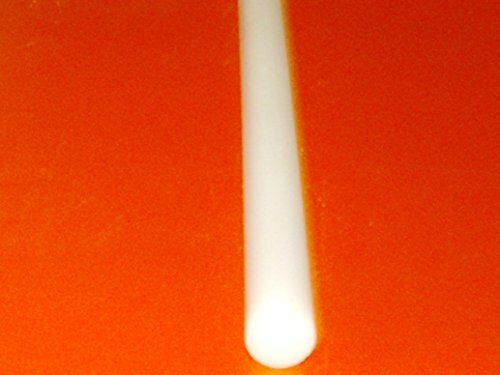 Phenolic G-10/FR4 is a plastic laminate produced from a fiberglass that is impregnated with epoxy resin. Also called Garolite or epoxy grade, Phenolic G-10 provides high moisture resistance and good electrical insulation properties for electrical applications. Plastic laminates are hard, dense materials made by applying heat and pressure to a series of layered paper, fabric, or fiberglass and then impregnating them with epoxy or resin. The most notable characteristics of plastic laminates are their moisture resistance, tensile strength, and typically good electrical insulating properties. Some grades also offer additional machinability. Moisture resistance describes the material's ability to resist moisture, which is important in electrical applications. Tensile strength, used to indicate the material s overall strength, is the peak stress it can withstand before it breaks. Electrical insulating properties such as dielectric strength and arc resistance refer to the voltage the material can tolerate. Machinability is how easy the material is to machine while maintaining a good finish. 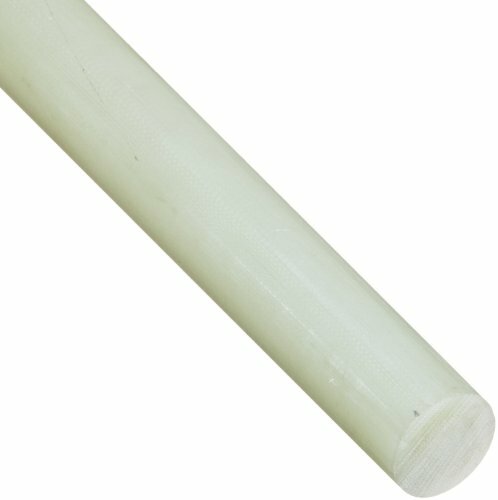 The HDPE round rod has a translucent white color and meets American Society for Testing and Materials ASTM D4976 and Underwriters Laboratories UL 94HB specifications. HDPE (high density polyethylene) is a rigid, tough plastic that offers good chemical resistance and low moisture absorption. HDPE is stronger and more rigid than LDPE. 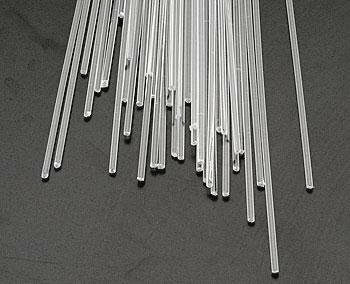 You are buying 15 (FIFTEEN) NEW 1/4" x 1/4" x 4" LONG CLEAR SQUARE EXTRUDED ACRYLIC RODS. 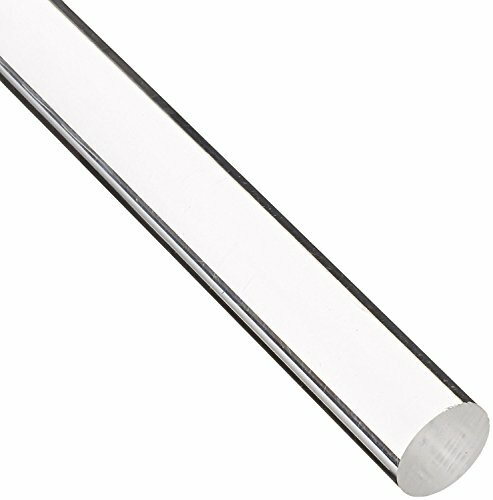 (One Quarter Inch X One Quarter Inch Square X FOUR Inch Long) The picture shows actual 1/4" square rods for representation of our product and you are buying and will receive FIFTEEN 1/4" x 1/4" x 4" RODS. SQUARE ACRYLIC ROD FACTS YOU SHOULD KNOW BEFORE BUYING 1. THE SIDES OF SQUARE RODS TEND TO BE SLIGHTLY CONVEX OR SOMETIMES CONCAVE. THEY ARE RARELY ALWAYS PERFECTLY FLAT. THAT IS THE NATURE OF EXTRUDED ACRYLIC SQUARE RODS. 2. 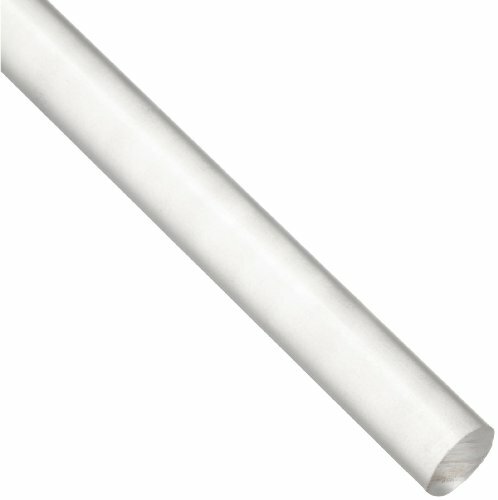 ALL EXTRUDED ACRYLIC RODS ON THE PLANET EARTH ARE MANUFACTURED THE EXACT SAME WAY AND HAVE THE EXACT SAME PROPERTIES MENTIONED HERE, REGARDLESS OF THE MANUFACTURER. A LITTLE RESEARCH ON GOOGLE WILL CONFIRM THESE FACTS. To assure that you get the finest quality, the protective sleeve is kept in place on the rod while being cut to protect the acrylic. Rod has saw cut edges on both ends. Please allow a length tolerance of +/- 1/16" on all pieces.